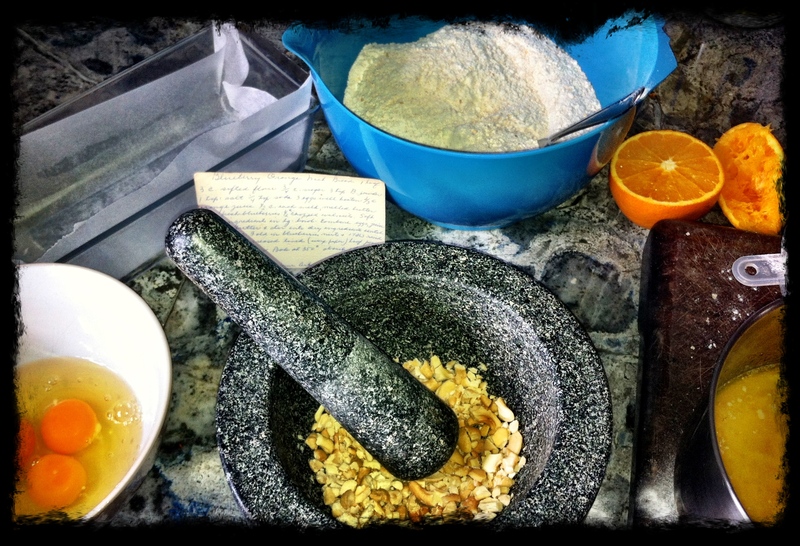 I have always enjoyed making (and eating!) bread, but my repertoire has been fairly limited. Lately I have been experimenting with all sorts of recipes. I have had some great successes and have had some impressive failures. The thing about bread making is that if your dough is too tough you can end up with a rock. It can also be very hard to work out what exactly goes wrong with a dud bread. You try a recipe that clearly works for someone else, but you just can’t make it do the right thing for you. It can be very frustrating! 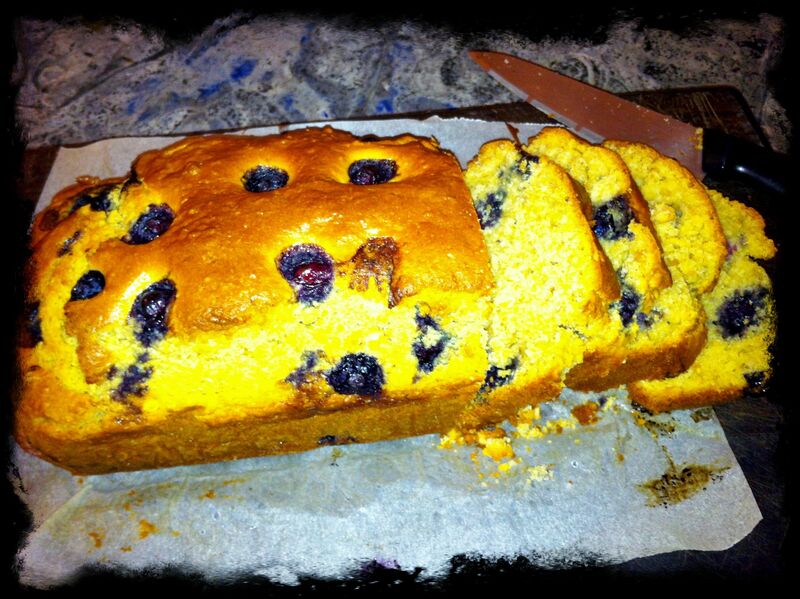 So when you find a good simple reliable recipe that works for you, hang onto it!! This recipe is a great starting point. I have made it many many times and it always works. It makes a medium density white loaf with beautifully crunchy crusts. Preheat oven to 50C for rising the dough. Lightly oil 2 loaf pans, and dust each with 1 T polenta. Combine dry ingredients in a large bowl and mix well. Pour in water and mix to a stiff dough. Place into a large oiled bowl and cover with a damp cloth. Place in the oven for 15 minutes. Lightly knead dough until it feels smooth and slightly elastic. This dough can be kneaded gently, pushing down with the heel of your palm and then folding the dough back onto itself. You want this dough to remain light and soft, so it doesn’t need too much pummelling and prodding. Place each loaf into a pan and dust with flour. Using a sharp knife cut 3 slashes into each loaf. Place back in oven, uncovered, to rise for 45 minutes. Remove from oven and turn oven temperature up to 200C, returning the pans to the oven when the correct temperature has been reached. Bake until loaf tops are golden and they sound hollow when you tap them. There’s an episode of Seinfeld called “The Dinner Party” in which Jerry and Elaine are on their way to a dinner party, and decide they need to take something with them for the hosts. They stop at a bakery wanting to buy a chocolate babka, but end up with a cinnamon one instead. Elaine is unhappy because she considers a cinnamon babka “a lesser babka”. There are different types of babka, which I believe originated in Poland, but it is traditionally baked on major holidays in a number of Eastern European countries. Some make babka as a cake, and glaze it with chocolate or vanilla icing and decorate with nuts and dried fruit. For others it is a sweet bread braided and filled with sweet cinnamon or chocolate fillings with streusel toppings. 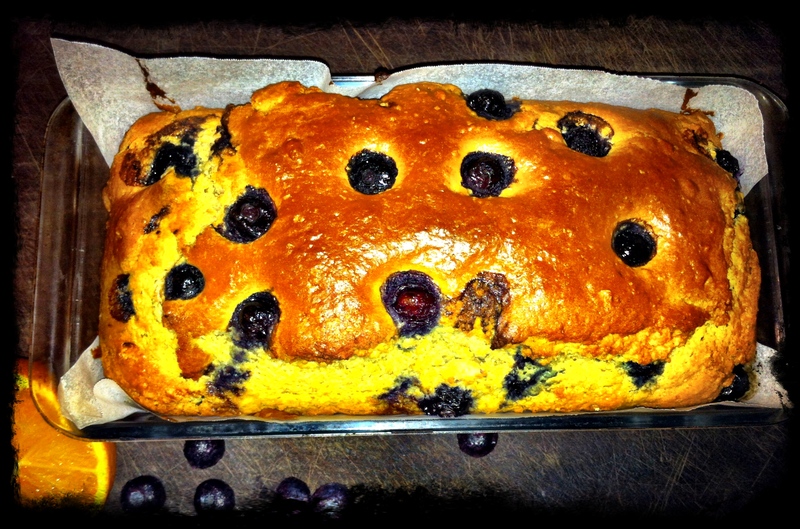 This latter version reminds me of the Bohemian sweet breads that I love so much, and which tend not to use chocolate. 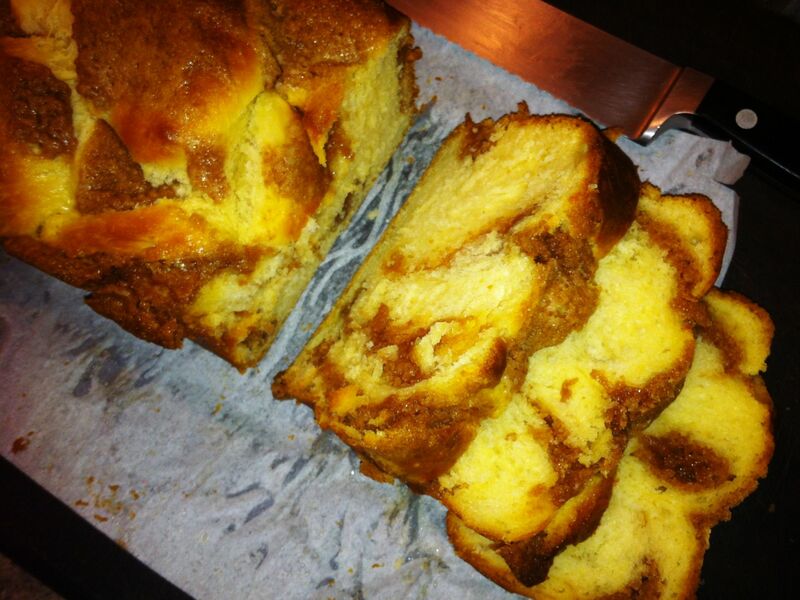 So for me, cinnamon is definitely not the lesser babka! Line 2 large loaf pans with baking paper. Beat cream cheese, oil and caster sugar until light and creamy. Beat in egg yolks. Combine milk and vanilla. Stir in yeast and set aside for 2 minutes to activate the yeast, then fold yeast mixture into egg mixture. Add flour and salt, and beat until the dough is soft and sticky. On a well floured smooth surface, knead the dought until it is smooth. Place in a lightly oiled large bowl. Cover with a slightly damp cloth and leave in a warm spot to rise (about an hour). While the dough is rising, the filling needs to be prepared. In a medium bowl, beat butter, sugar and cinnamon until light and creamy. Add flour, milk and egg and beat until well mixed. Set aside until required. 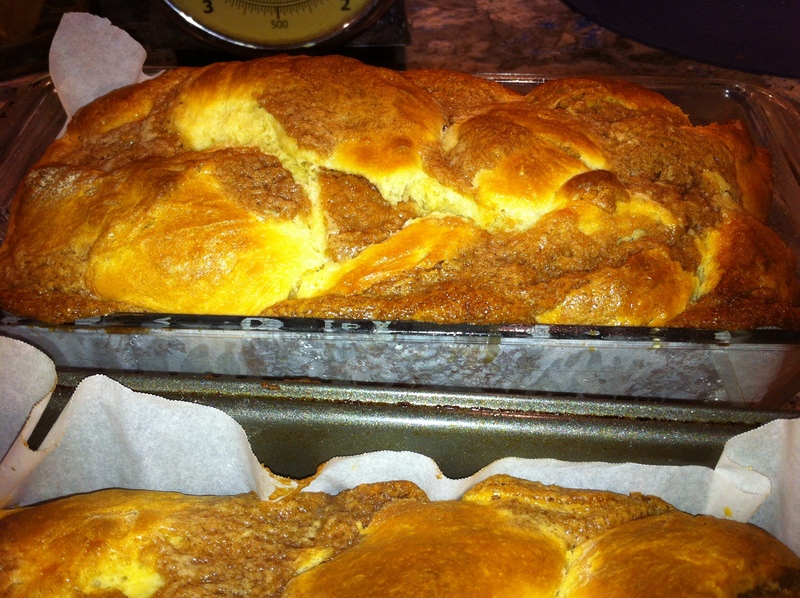 Once the babka dough has doubled in size, remove from the bowl and divide into 4 pieces. Roll 2 pieces into braid-able lengths and set aside. Roll remaining 2 pieces into braidable lengths and then flatten them so they can be filled. Divide filling into thirds. Using 1/3 of the cinnamon mixture each, place a line of filling along the length of both flattened lengths and gently wrap dough around the filling. Cover the remaining filling and leave in the refrigerator until needed. Create the 4 lengths of dough together. 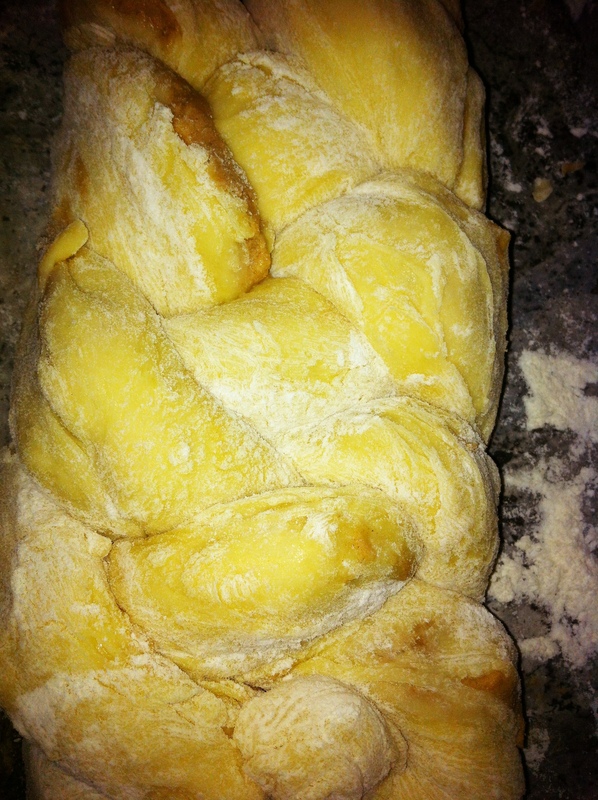 Cut braid in half crossways and place each piece in a prepared pan. Cover with the cloth and leave to rise again until doubled in size. Preheat oven to 180C. Brush each loaf with cream and then crumble the remaining filling mixture over the tops. Bake for about 30 minutes or until firm. Allow to cool in their pans for 5-10 minutes before removing. Happy Easter everyone! I hope the day was filled with the joy of life, and perhaps some chocolate! Most years I actually make chocolate for Easter. While I am not averse to buying good chocolate I usually make something a bit special to maximise the indulgence factor. This year I bought new chocolate moulds and a range of accoutrements in preparation but the inspiration didn’t come. Instead, this has been the year for hot cross buns. Wal has always loved them, and would buy them year round if he could, so it seemed about time to offer him some home made buns. It took a bit of effort to fine tune my recipe to meet the collective family requirements (they are becoming quite the critics, these guys! 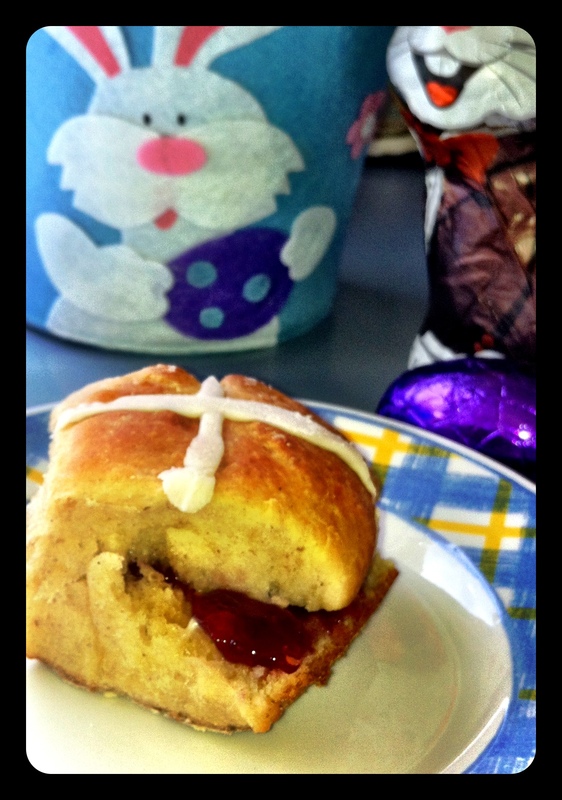 ), but these buns are delicious, if I do say so myself! And as with much of what I cook, they are very easy to make. Heat milk to almost boiling. Add butter, sugar and salt and remove from heat. Add water and leave to cool until lukewarm. Add the yeast and mix. Blend in the egg. Mix in the cinnamon and sultanas. Gradually add the flour. Mix until well blended and soft. Leave in oiled bowl in a warm area for 45 minutes to rise. Preheat oven to 220C. Place dough on floured board while you work with it. Shape into round balls (recipe will make about 20) and place closely together on lined baking tray. Lightly brush with milk and set aside for 3 minutes. 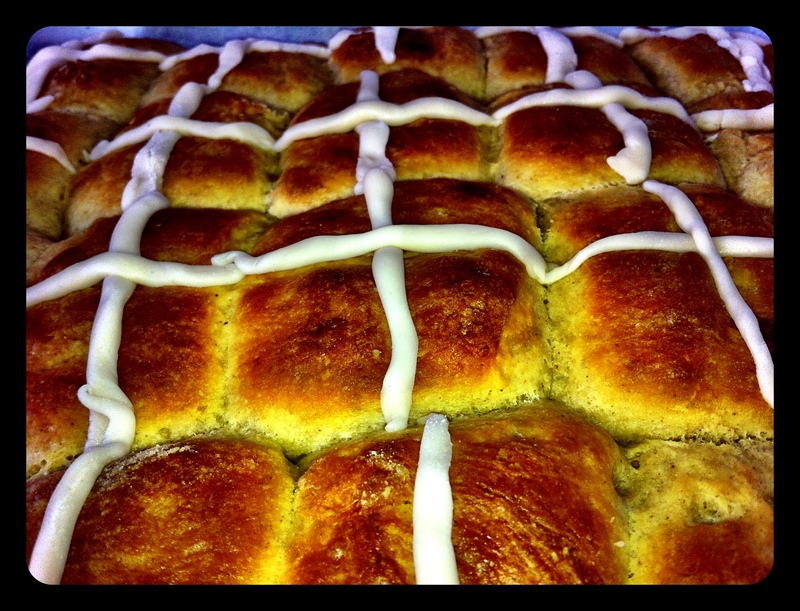 Then, using a sharp knife, cut a cross into each bun. Bake for 20 minutes. Towards the end of the baking time, knead the icing until it is pliable. Roll into a long thin strip. Working quickly as soon as you take the buns out, fill the cross cuts with icing strips. Enjoy them while they are still hot! When I was little there was a specialist bread company that made a beautiful honey loaf. The loaves were small and dense and chewy, with a lovely dark brown honey top. So good! but also SO hard to find. Few shops stocked them, and they went fast – so they were strickly for early risers! Sadly the bakery is no longer, and I haven’t seen anything ressembling them sold commercially since. The key to success is good quality honey with a flavour that you enjoy. I use Mimosa honey, which is only available on the NSW south coast. They offer a few varieties, all delicious, and importantly, all very fresh and pure. On this occasion I used a clover honey. Preheat oven to 160C. Line a loaf pan with baking paper. Place all ingredients except the honey in a food processor. Blend until well mixed. Add honey, reserving about 1 T, and blend again until just mixed. Bake for about 50 minutes or until skewer inserted into the middle comes out clean. Remove from oven and immediately brush top with reserved honey. Leave in pan to cool. Serve plain or with butter. When I was a kid strawberries were a real treat. I am not sure why. Maybe they were really expensive back then. Whatever the reason, when a punnet appeared in the house (if it survived the car trip back from the markets) it would be pounced upon by everyone home, as if our very lives depended on it. So it was a particularly rare event that strawberries were used in a recipe of any kind. Occasionally my mom would hide some to sneak into a fruit salad but that was it. Nowadays, with Sprog 2 totally addicted to them, strawberries are a staple in our house. They are still pounced upon immediately, and she can eat a whole punnet by herself in moments, but I follow my mother’s example and hide them whenever I have a particular purpose in mind. 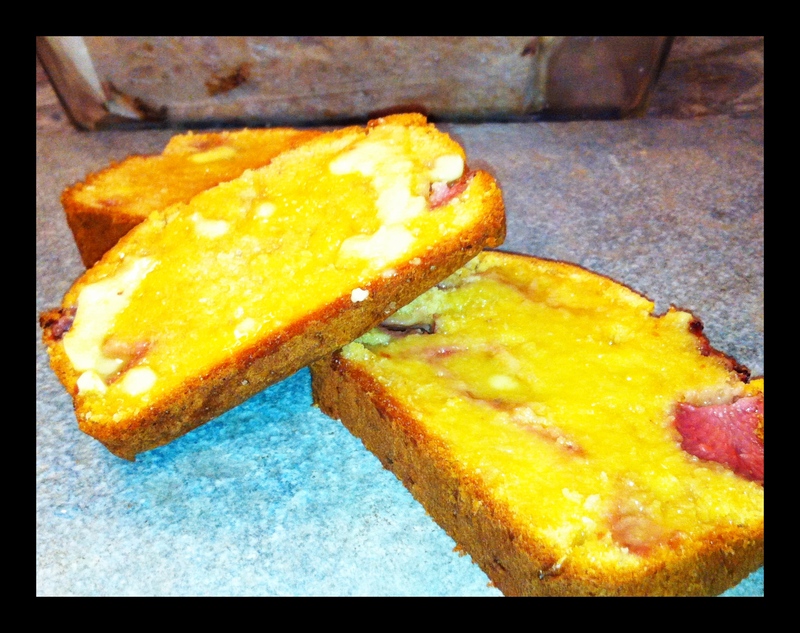 I have tinkered a little with a recipe found on a blog that I like, http://sharingthefoodwelove.wordpress.com/2012/08/11/strawberry-and-coconut-bread/ (you should have a look, she has some great ideas). 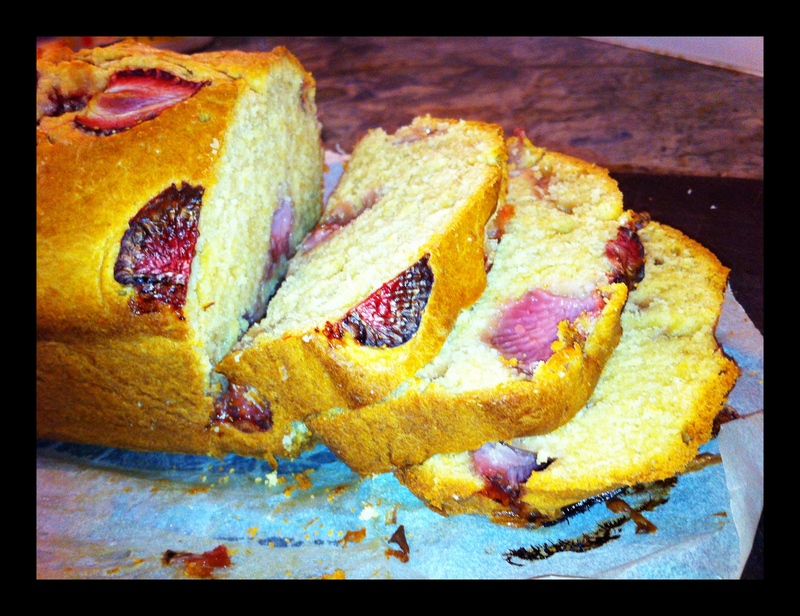 I love to make bread with berries, but it hadn’t crossed my mind to try strawberries. 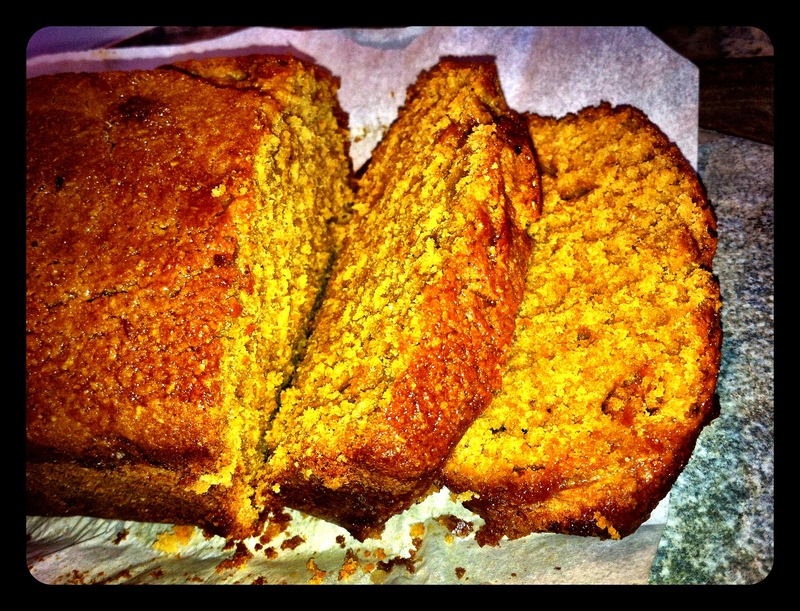 The bread is lovely and moist, and not too sweet. The coconut gives it a wonderful texture, while the strawberries give it lift and freshness. Really yummy. Thanks for the inspiration Leah! Wash and dry strawberries, setting a couple aside for decoration. Pre-heat over to 180C. 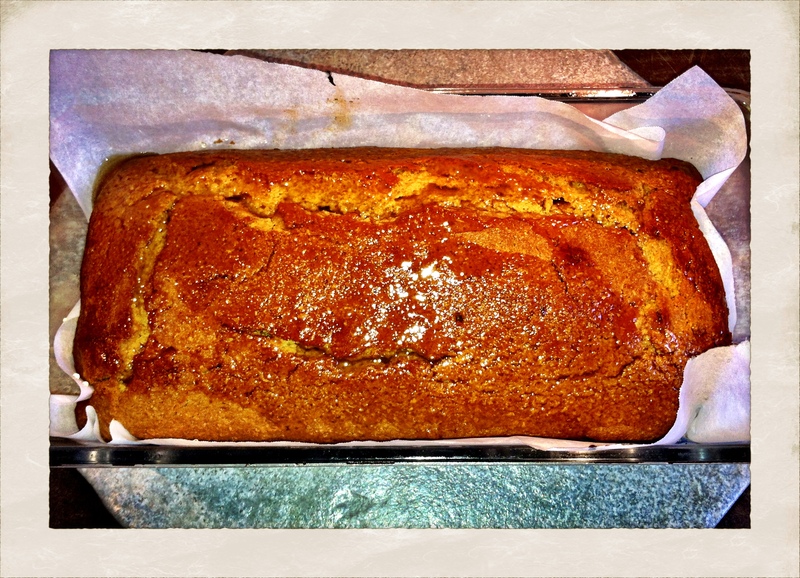 Line loaf pan with baking paper. Melt butter and blend with sugar until light and fluffy. Add eggs, vanilla, milk and coconut and stir until well mixed. Add flour and baking powder in batches to create a batter. 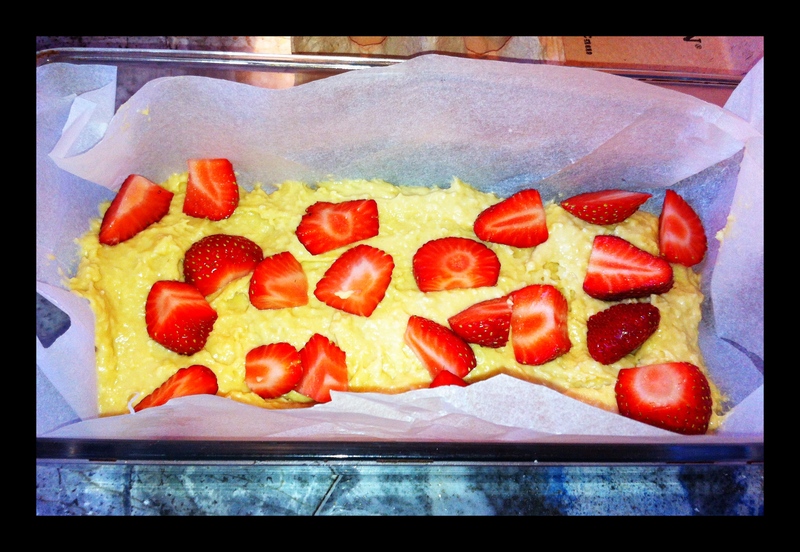 Spoon a layer of batter evenly into the pan and then layer half of the strawberries on top. Gently mix remaining strawberries into the batter and spread into pan. Slice set aside strawberries and decorate the top of the loaf. Cook 35-45 minutes or until a skewer inserted into the middle of the loaf comes out clean. Cool before slicing. It’s delicious on its own or with butter, and is fabulous toasted. Before I had kids I used to brag that there was no way I would ever turn into a team sport groupie. In particular, I claimed that I would never ever EVER become a soccer mom. But then, Sprog No.1 became addicted to the game. My little soccer player lives to play. There is no such thing as too much soccer. He plays two games per week, trains three times, he plays in the back yard and at school, he plays soccer on the Wii and iPod, and he watches it on TV. He dreams of playing for Australia. One day at a game I heard a loud raucous voice screeching “just kick the ball!!”. For split second I thought “who was THAT?”, and then I realised it had happened. I had morphed into a Soccer Mom without even seeing it coming. I have since learned the value of having a chair and a magazine so that I can distance myself from the very tense games! 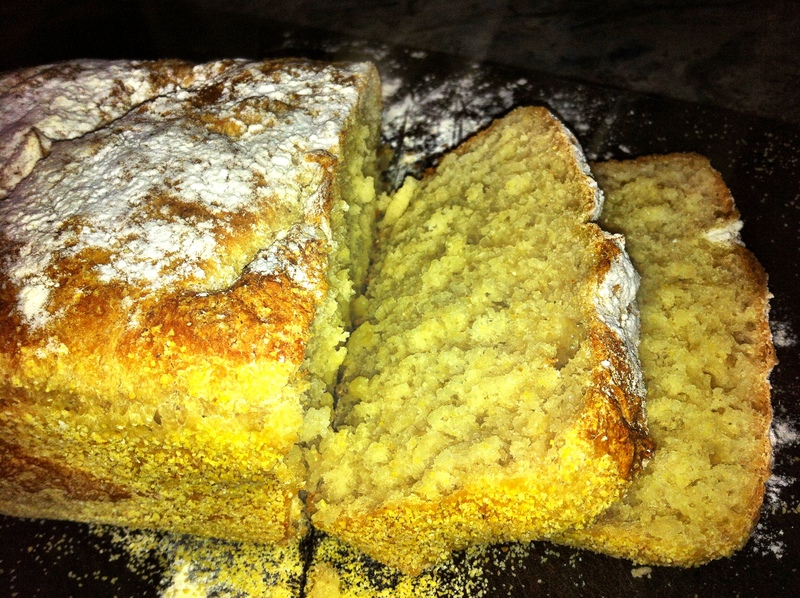 This loaf is adapted from a very old recipe of my grandmother’s. She loved making all sorts of bread, especially sweet breads. This one is quite dense, has a lovely deep colour and a texture very much like a yeast bread. Preheat oven to 175C and line a loaf pan with baking paper. Sift dry ingredients together in a large bowl. In a separate bowl, combine well beaten eggs with juice, milk and melted butter. Pour egg mixture into the dry ingredients and mix well. Add berries and nuts. Pour into pan and back for about 45 minutes or until browned and a skewer inserted comes out clean.